Pivot 1.5 Cal is a Therapeutic, Peptide-Based, Very-High-Protein Nutrition for Metabolic Stress. PIVOT 1.5 CAL is designed for metabolically stressed surgical, trauma, burn, and head and neck cancer patients who could benefit from an immune modulating enteral formula. 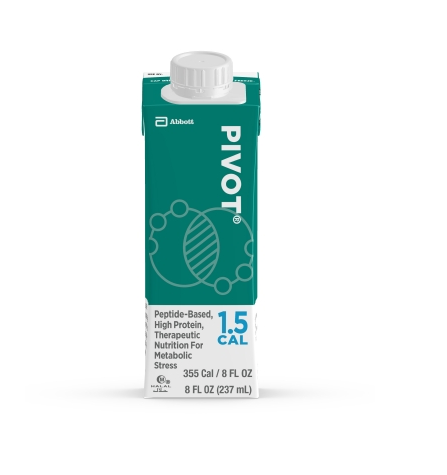 Pivot 1.5 Cal Therapeutic, Peptide-Based, Very-High-Protein Nutrition is used for tube feeding. 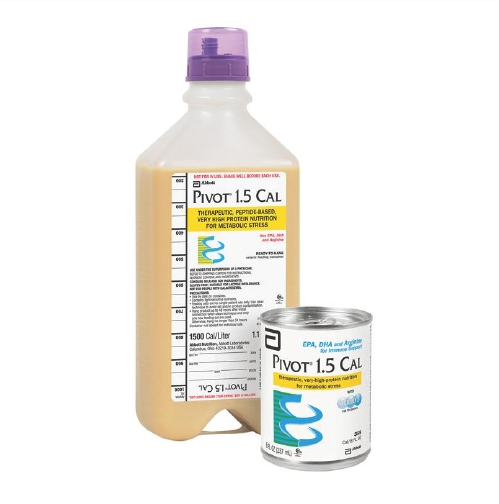 Pivot 1.5 Cal provides sole-source nutrition. Use Pivot 1.5 Cal under medical supervision. Pivot is not for IV use or for people with galactosemia. Very high protein (93.8 g/L, 25% of calories) to support protein synthesis, tissue repair and wound healing. Elevated antioxidants vitamin C, vitamin E and beta-carotene to help reduce free radical damage. Meets or exceeds 100% of the RDI for 24 vitamins and minerals in 1500 Cal (1000 mL). Pivot 1.5 Cal Product Information contains details for vitamins, minerals, protein and calories. Water, Corn Syrup Solids, Hydrolyzed Sodium Caseinate, Whey Protein Hydrolysate, Structured Lipid (Interesterified Marine Oil [Contains One or More of the Following: Anchovy, Menhaden, Salmon, Sardine, Tuna], Medium-Chain Triglycerides), Soy Oil, Canola Oil, L-Arginine, Fructooligosaccharides, Potassium Citrate, Citric Acid, Calcium Phosphate, Magnesium Chloride, Soy Lecithin, Natural & Artificial Flavor, Ascorbic Acid, Cellulose Gel, Choline Chloride, Magnesium Phosphate, Potassium Chloride, Carrageenan, Taurine, d-Alpha-Tocopheryl Acetate, L-Carnitine, Cellulose Gum, Zinc Sulfate, Ferrous Sulfate, Niacinamide, Calcium Pantothenate, Manganese Sulfate, Cupric Sulfate, Thiamine Chloride Hydrochloride, Pyridoxine Hydrochloride, Beta-Carotene, Riboflavin, Vitamin A Palmitate, Folic Acid, Biotin, Chromium Chloride, Sodium Molybdate, Potassium Iodide, Sodium Selenate, Phylloquinone, Cyanocobalamin, and Vitamin D3. Contains milk and soy ingredients. Water, Corn Syrup Solids, Partially Hydrolyzed Sodium Caseinate, Whey Protein Hydrolysate, Structured Lipid (Interesterified Marine Oil [Contains One or More of the Following: Anchovy, Menhaden, Salmon, Sardine, Tuna], Medium-Chain Triglycerides), Soy Oil, Canola Oil, L-Arginine, Fructooligosaccharides, Potassium Citrate, Citric Acid, Calcium Phosphate, Magnesium Chloride, Soy Lecithin, Natural & Artificial Flavor, Ascorbic Acid, Cellulose Gel, Choline Chloride, Magnesium Phosphate, Potassium Chloride, Carrageenan, Taurine, d-Alpha-Tocopheryl Acetate, L-Carnitine, Cellulose Gum, Zinc Sulfate, Ferrous Sulfate, Niacinamide, Calcium Pantothenate, Manganese Sulfate, Cupric Sulfate, Thiamine Chloride Hydrochloride, Pyridoxine Hydrochloride, Beta-Carotene, Riboflavin, Vitamin A Palmitate, Folic Acid, Biotin, Chromium Chloride, Sodium Molybdate, Potassium Iodide, Sodium Selenate, Phylloquinone, Cyanocobalamin, and Vitamin D3. Contains milk and soy ingredients. All liquid medical foods, regardless of type of administration system, require careful handling because they can support microbial growth. Follow these instructions for clean technique and proper setup to reduce the potential for microbial contamination. NOTE: Failure to follow the Instructions for Use increases the potential for microbial contamination and may reduce hangtime. Pump feeding is recommended; use an 8 Fr or larger tube. Gravity feeding not recommended. Always follow directions for use provided with feeding set. Remove the dust cover from the Abbott RTH Safety Screw Cap. Remove the dust cover from the safety connector on the feeding set. Insert the safety connector into the port on the Abbott RTH Safety Screw Cap, completely pierce foil. Turn the safety connector clockwise until it is securely fastened. Close clamp on set before inverting container. Invert container and suspend, using the hanging ring on the bottom of the container. Shake well. Pivot 1.5 is ready to use. Once opened, cover, refrigerate and use within 48 hours. Adjust flow rate and volume according to patient's condition and tolerance. Feed by pump at room temperature with an 8 Fr or larger tube; gravity feeding not recommended. Avoid contamination during preparation and use.